The World Wide Web is a big place – but let’s be honest, a lot of online users don’t really benefit your business. Traffic from across the world can be a waste if your business only has one or two physical locations. This doesn’t mean that all online marketing efforts are a waste. Studies show that fifty-six cents of every dollar made in a brick-and-mortar location are influenced by digital marketing efforts. So it’s time to narrow your efforts down to local SEO. You may have been in this situation before. You’re scrolling through AdWords or Analytics, assessing what keywords are bringing your customers onto your page. You’re a business in Melbourne, Australia – but customers looking at your website aren’t even from Melbourne at all. They may have even found your business while searching for the Melbourne in Florida. All of this ad spending and content creation is a waste if you know for a fact that these users are not likely to convert. 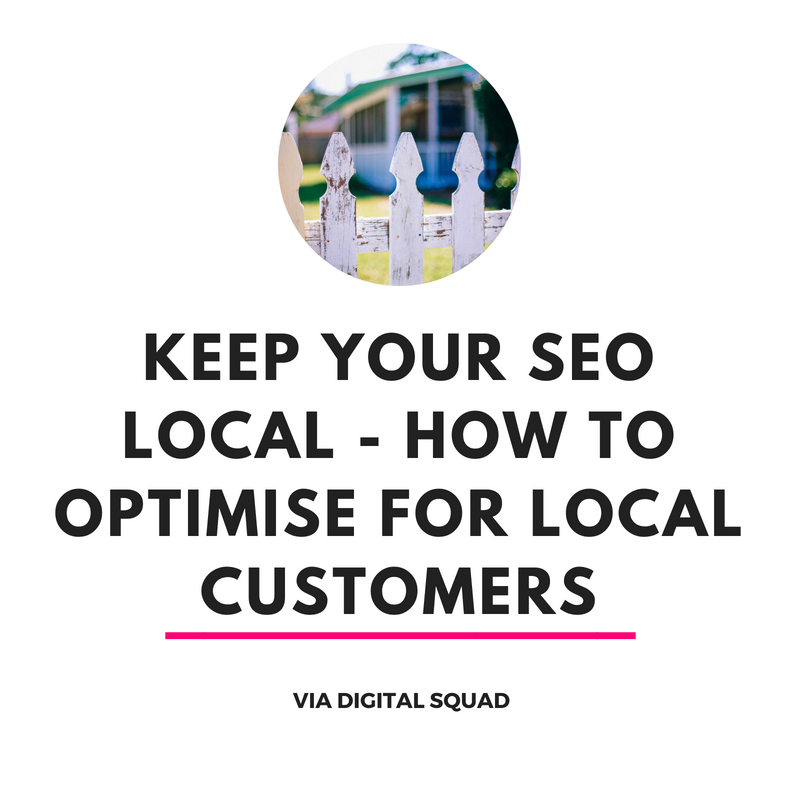 Consider the importance of local search engine optimisation (SEO) while you are creating content and building a marketing strategy for your website. Local SEO has a special focus on users that are within a certain radius of your business. The targeted audiences are limited to specific cities and surrounding neighbourhoods, rather than the entire state, territory, country, etc. Why is it important to appear on local SERPs? People are making local searches. Just under half of all Google searches (46%) are local. If a consumer is searching from across the world for a business or service, they are more likely to include the location that they are looking for in the search. These searches have a high purchase intent. When users are looking specifically for a phone number or a specific business location, they have already decided on a business to investigate and know what they are searching for. Half of all mobile searches for a business result in an in-store visit within 24 hours. Local searches are an important place to put your business information and grab users’ attention. They are also great focus for boosting your return on investment (ROI.) Your local customers are some of your most loyal customers. If you want to create content or get reviews to optimise your local listings, all you have to do is ask. Seven out of ten customers will leave a review if a business asks for one. User-generated content is especially relevant for local businesses and local search. Consumers respond better to testimonials and content from users who are more similar to them, including users who live the same zip code. If you want to shift your SEO focus to reach more local customers, you can add specific tactics to your overall SEO strategy. Before you implement these tactics, complete an audit of your current conversion rate and traffic. Monitor your progress and you “zoom in” to a certain radius. If you want your business to show up in local results, you have to set up a Google My Business account. Period. A Google My Business account gives you control over how your business appears on Google, and gives the search engine more information and more opportunities for putting your business into different SERP features. Only 44% of businesses have a Google My Business account, so it’s good to jump on the trend now. Even if you do not have a physical location, you can still set up your account to include your business name and the right contact information. Verifications are required to make the information public, but phone verifications are available in addition to typical postcard verifications. Take well-lit photos of the interior and exterior of your business so customers can identify you and get an idea of what the interior looks like. Ask for (and respond to) customer reviews. The more reviews you receive, the better idea users will get of what to expect from your business. Download the Google My Business app to view your listing on mobile devices and make updates to your listing from anywhere. Remember keywords even as you optimise your listing. Google My Business allows businesses to create content in the form of statuses, images, and responding to reviews. Even adding a high-volume keyword into your business description can help users find your business faster. One of the cool features of Google My Business is the in-depth analytics you can get from your account. Insights on Google My Business can show you how your customers are finding your listing, the physical locations of customers who are searching for you, and what actions they are taking after they find your listing. If customers from one neighbourhood are more likely to convert, for example, you know to ramp up advertisements and SEO strategies in that area. Google My Business and Google+ are two different accounts. In addition to Google My Business, establish your business on other channels where your customers are looking for reviews and information. Respond to customers and answer any questions they have about amenities, service, or their experience at your business. In all of the statistics presented, you may notice quite a distinction between smartphone users and desktop users. Advancements in mobile technology allow consumers to conduct research from anywhere – including in the store. A whopping 84% of all smartphone shoppers conduct research about products and stores while they are standing in the physical store. Over half of consumers (58%) use their smartphone to look up product information while they are looking at the physical product itself; 54% use their phones to look up prices. Other uses for smartphones in brick-and-mortar locations include accessing digital coupons, scanning QR codes, and accessing the retailer’s mobile app. Statistics about how users conduct mobile research vary between different demographics (for example, men are more likely to search for information about products, and women are more likely to search for coupon codes,) so keep your specific target audience in mind when you create and optimise your mobile content. What does this mean for your business? It’s time to set up your web content so that it looks pristine on mobile. The umbrella of “user experience” includes mobile user experience. How long are pages taking to load on smartphone devices? Half of mobile local searchers are looking for basic business information, like contact information or driving directions. Is this information easy to find on mobile listings, including your website? Don’t neglect your blog posts, eBooks, and other content. If you are a local business, let your content reflect your relationship to your home base! The more content that appears when people search for businesses around your hometown, the better. Blog posts that highlight your team members, their contributions to the local community, etc. Keywords don’t just have to appear in content. Don’t forget the importance of adding your location to title tags, URLs, alt tags, etc. Add internal and external links to local businesses. If you have the room to add a keyword to the title of a blog post, you should. The more you can add local content and keywords (while appropriate,) the more you can establish yourself as a top local business in the area. Earlier in the post, we mentioned that these keywords tend to have high purchase intent. Write content with local keywords that speaks to users along each part of the buyer’s journey. This content includes more user-generated content, optimised listings, and offers that make your business stand out among other local businesses that show up on search results. Want to learn more about search trends in your local area? Reach out to a local SEO agency. An agency can help you audit your current marketing materials and find opportunities for adding local keywords or creating listings that will reach the right users. Contact the team at Digital Squad today to learn more about local SEO opportunities for your business.